Village Volunteers are representatives from every corner of the Wardha district that function as intermediaries between citizens and the Kamalnayan Jamnalal Bajaj Foundation (KJBF). Our group held workshops with them to learn more about their work and recognize their critical role within KJBF. People become Village Volunteers for a variety of reasons. Some hesitantly join at the urging of friends and family, while others jump at the chance to have a leadership role within KJBF. Whether shy or outgoing, they are selected because of their dedication and ability to work hard. Women, men. landowners and tribal members come together to guide water, farming, and microfinance initiatives within their villages. Village Volunteers discuss the challenges they face and brainstorm solutions at a workshop organized by CMU students. Village Volunteers not only help run KJBF initiatives, but they are transforming citizen involvement within Wardha. Rebuilding the trust of villagers is key in a region that has suffered from government mismanagement and little outside assistance. Not surprisingly, villagers are initially skeptical of proposed KJBF projects: Farmers fear that KJBF might exploit their land, and microfinance group members have difficulty trusting one another with money. Volunteers allay these fears by “effectively communicating the goals and methods of KJBF and providing villages with an accessible support system.” This dedication and clarity helps to rebuild trust between KJBF and villagers so that projects will be embraced and cared for by the community. 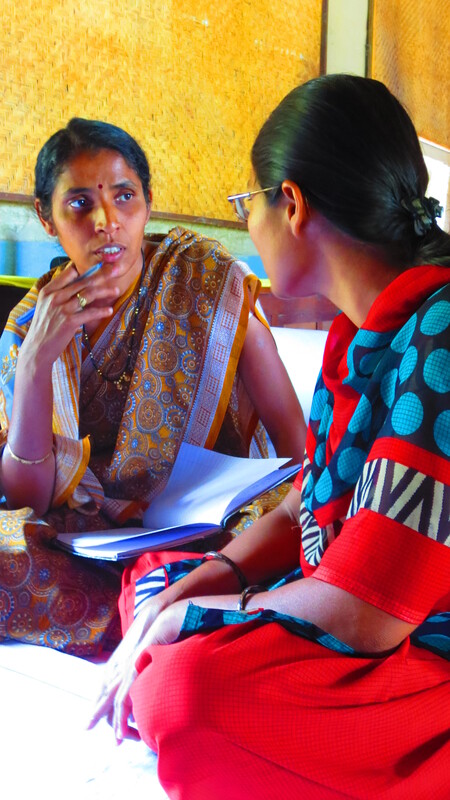 The Village Volunteers are knowledgeable teachers to the Social Change Semester students. Not only does the program allocate critical on-the-ground support, it emphasizes to both Volunteers and villagers that they are valued members of KJBF. As the Social Change Semester aspires to expand into year-round partnerships and involve more CMU students, it has to continue building support and trust amongst Wardha citizens. While this relationship has begun through our various workshops and field visits, the challenge is now to continue these interactions once we return to the United States. All quotations are from the transcription notes of Alexandria Hernandez. As the inaugural Social Change Semester group, you should all be extremely proud of what you have accomplished and the groundwork you are laying for future collaboration. Once again, great job!